Fact: Doug Martsch likes to solo. A lot. 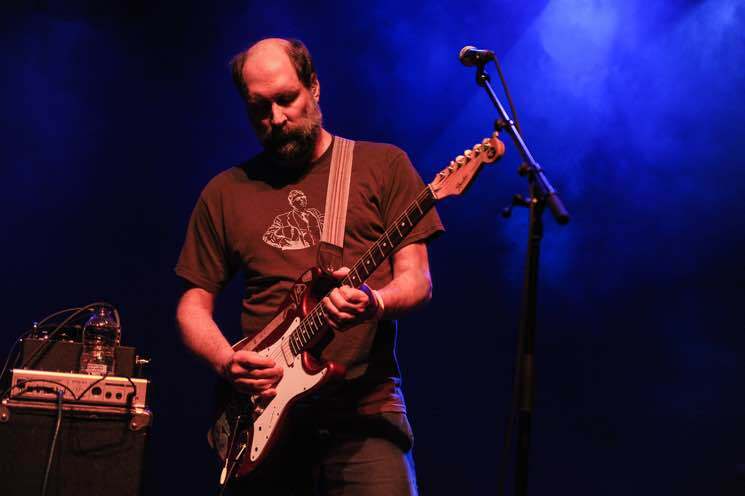 And for Built To Spill's first headlining Toronto show since the release of last year's Untethered Moon (for which they only played at last year's Toronto Urban Roots Festival), he left no solo unturned. Martsch also didn't appear too concerned with promoting the latest album, as the set was a compendium of songs from almost their entire catalogue. Maybe the song selection had to do with the size of the venue, which felt like a daunting space to fill considering they've pared down to a trio for this tour (rounded out by drummer Steve Gere and bassist Jason Albertini), down from their usual quintet size. Martsch acknowledged this too, commenting to the 1,000-plus crowd watching him on stage, "Gotta know our set list because this place is so giant." They began with Perfect From Now On's lengthy "Kicked It In The Sun," the seven-minute epic that can feel like three songs in one. The band's debut, Ultimate Alternative Wavers, then got some early love with the spirited "Three Years Ago Today," followed by fan favourite "The Plan" from Keep It Like A Secret, a song that will hopefully one day get its deserved Guitar Hero feature. There was little banter — Martsch finally addressed the crowd with a "How's it going?" an hour in — and no particular flow to the show, as the band threw together songs from every era in their 24-year career. Ironically enough, it was a cover of the Halo Benders' (Martsch's side-project with Calvin Johnson) "Virginia Reel Around The Fountain" that proved to be the real standout of the set. Martsch seemed to fall into a trance-like state and dazzled his way up and down the fret board with some truly hypnotic finger work. He showed off plenty of those guitar heroics, but not on every single song. "Twin Falls," a short, little ditty from There's Nothing Wrong With Love, failed to produce a solo. Just like the album's sequence, though, it led right into "Some," during which Martsch made up for it with a clinic — soloing with only one hand, while he turned knobs on his waist-high pedal board. A cover of Creedance Clearwater Revival's "Effigy" seemed like a perfect way to wind down the night, with Martsch inhabiting the spirits of the Fogerty brothers. They then ended the set with a three-song encore, throwing in the tuneful "Liar" from You In Reverse, again shifting tempos with the extensive "Randy Described Eternity" and the apropos "Car." On this night, Built To Spill were all about the basics, but it worked for them. Martsch, as always, was the guitar god he's known to be, never once switching from his cherry red Strat or even taking five minutes to tune the thing. And as a lean trio, they managed to hit with as much potency as they ever do with additional bodies on stage.